Paris Haute Joaillerie Pritemps et Ete 2011. 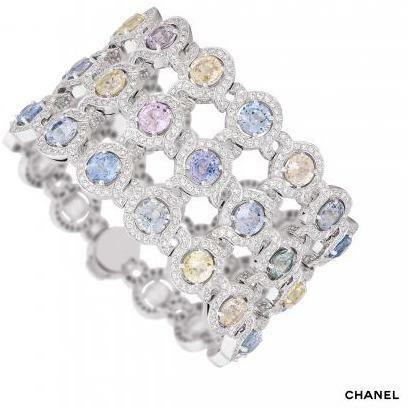 Chanel showed their Haute Joaillerie 'Secrets of the Orient' collection in Place Vendome in January to an eager audience. 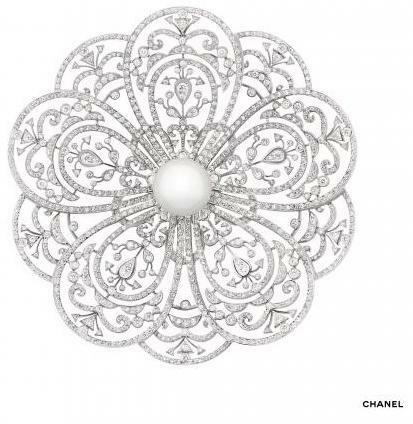 The first piece, the Camelia Broche Dentelle (above left) captures Gabrielle Chanel's favourite flower in diamonds. This time taking it's inspiration from the Byzantine influences of Venice the Camelia is opened out to represent a Rose Window with a pearl at it's centre. Next to it is a beautiful ring which represents the Venetian cupola. 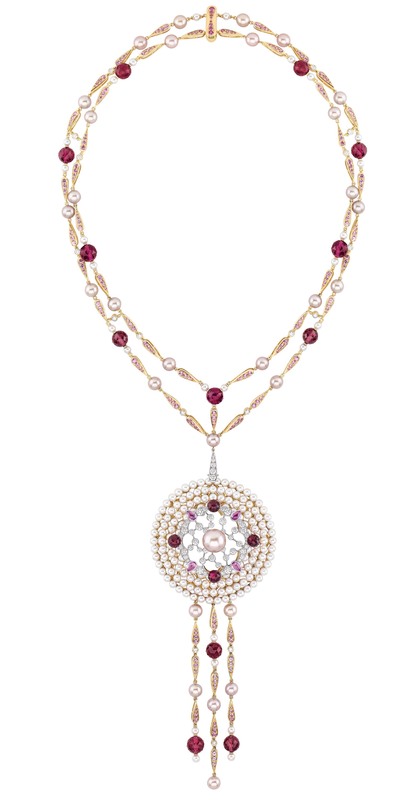 Heavenly cirles of pearls support precious stones suggesting once again the Rose surmounted by a large pink pearl. I'm in love with collection and I love it that Chanel have adopted my favourite flower, the magazine's emblem for their collection. A Blush of Rose! Also as a Classical Studies graduate I'm a big fan of all things Byzantine and it's echos in our times. The beauty of these pieces takes my breath away and I feel again close to the ghost, spirit and inspiration of Madamoiselle herself. I'm looking forward to seeing more of the Rose at Chanel. From the moment that I first saw this necklace I knew it was very special. It's a modern piece that has strong echos of the Eastern Past. It's a composition that celebrates the symetary in lots aspects of Eastern mysticism. I think that this symbolises the Rose again not only in spectacular pendant at the centre of the piece but also in the beautiful symmetry of the stones and settings that form the top part of the necklace. I think this piece fits into the intriguing story of Gabrielle Chanel's personal fascination with Eastern mysticism so perfectly. Many people are unaware that alongside her life in the Fashion World she was always exploring, always seeking more knowledge of different cultures and traditions and somtimes through her fashion communicating these forward to others. In many ways Gabrielle Chanel was not just a lady who wanted to educate our sence of fashion I think in her own way she often hoped to teach and impart more to her students. A teacher in many ways. Looking in more detail at this piece I can see more flower-like emblems within it. The light Pink stones, amythists I believe, are shaped like petals and they fan out around the central part of the pendant adding to the effect of a flower. 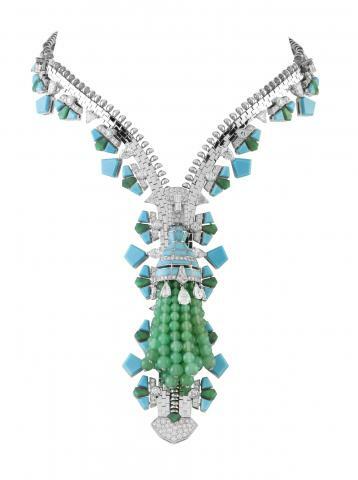 This necklace although part of the Spring-Summer 2011 Haute Joaillerie collection would be a perfect fit with the pre-fall Byzantium collection shown in Paris in December 2010. Above are two cuffs, termed 'Manchettes' in Paris that both look East for the inspritations in their composition. 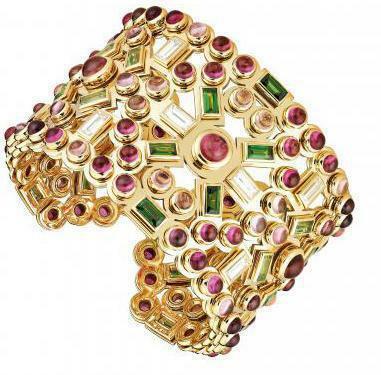 To the left the Persian inspired Cuff is vibrant in the colours of Red, Green and Gold. This reminds me not only of hte rich fabrics of the Ottoman era but also of the vibrant colours and life that bloom in the midst of those great deserts in the East. The second cuff to the right is inspired by Venice. The glacial colours of the stones remind me of the light sparling on the waters surface as the boats glide along the canals. Also the vibrant colours in the many paintings of the city, most celebrated of which is Canelletto. I think this one is my favourite of the two. I prefer something lighter and more playful with sparkle and I've always been a waterbaby. My thanks to the lovley Amanda and the wonderful team at Van Cleef & Arpels for sending along these images of their latest fascinating collection. Entitled Zipped this clever collection looks at that most widley used fashion staple and turns it into something extraordinary. 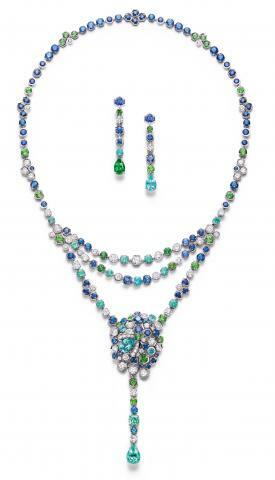 This collection revisits previous Haute Joallerie collection of the 1950s and updates it with some new pieces. Above left is one of the new peices a necklace set with Saphires and Diamonds that I believe can also be worn as a bracelet. 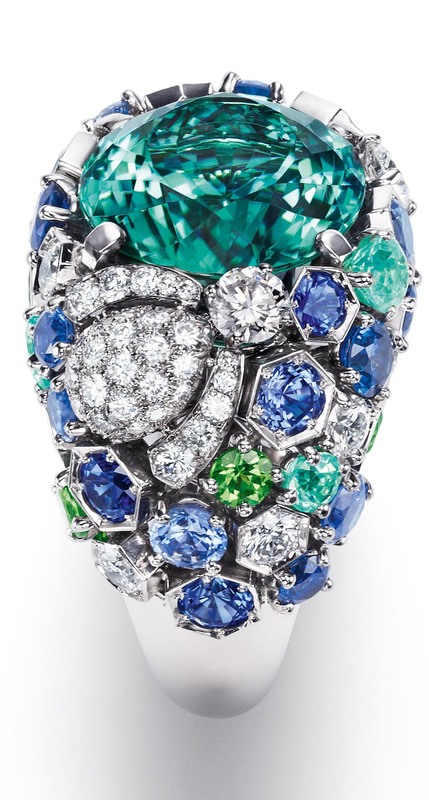 I think that this shows the artistry of Haute Joaillerie in such an intriguing way. To the right is a gold and diamonf piece from the antique part of the collection that dates to 1951. These pieces where famously worn by Wallace Simpson, Duchess of Windsor and worn with a simple Black dress I'm sure they where a captivating talking point at parties and Dinners she attended. The next piece below is probably my favourite from the collection. I love the tassels at the end of the Zip that are made from Pearls. When this piece is worn on the wrist or as a necklace they make a gentle soft rattle. The striking geometric shapes that run along the boarder of zip give a clear stylish frame. 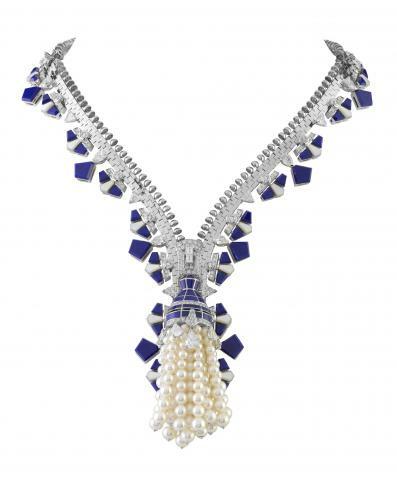 I believe they have used Blue Lapis Lazuli and White Mother of Pearl for the Art Deco design. This piece (above left) has a very similar design and it disproves the old saying that "Green and Blue will never do", it certainly does here. If you look closley you can see amazing detail at the head of the zip fastener. It almost looks like a dress with trailling skirts fringed with tiny delecate diamonds. Really wonderful. Above right is a piece from the original 1951 collection. The design is perhaps less technically complex than the modern pieces but you can see quite clearly how this unique idea inspired the 2011 Spring-Summer collection. 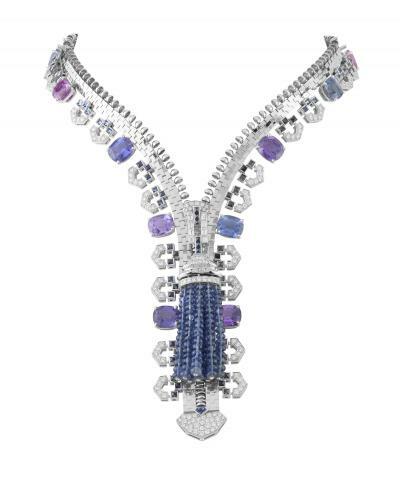 Boucheron invited us into a World of Enchantment. 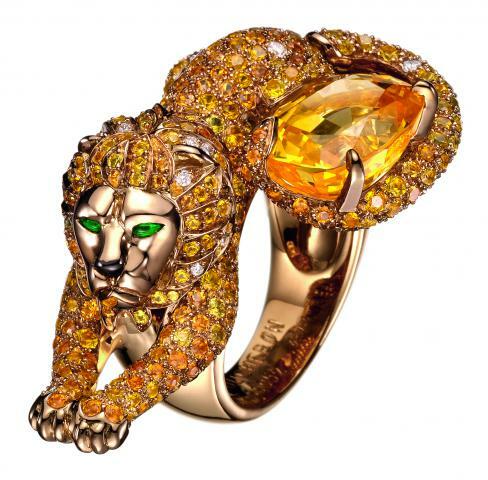 Their Haute Joaillerie collection was grouped around several themes all related to the animal kingdom in some way real or imagined. The collections where Aquatic Waves, Bewitching Snakes, Exotic Parade, Playful Nature, Tales and Legends and Wings of Desire. From the Aquatic Waves collection these pieces in particular caught my attention. I love Sea Horses (Hippocampe en Francais) and these creations are wonderful. 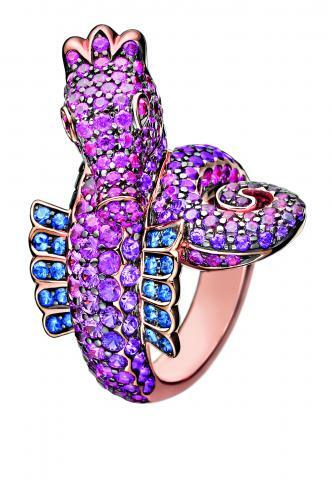 On the left the ring shaped as a Sea Horse is so charming. There's an amazing colour in the stones as the piece moves with the hand it's on so the Violet shimmers and changes. 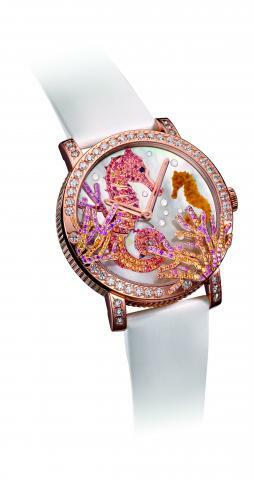 To the right above the Montre Crazy Hippocalme shimmers with precious corals from the sea bed. I think it's a parent and child Hippoclame scene underwater in their secret world but all of these pieces can be worn by adults and certainly should be. Again this piece combines my favourite colour themes of Pink, Gold and Diamonds. It's somthing fun and pretty to sit on your arm and bring a smile every day. 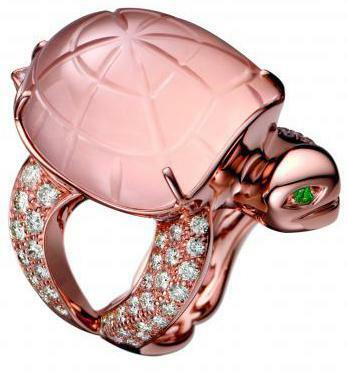 The Bestiaire Tortue ring has gleaming Green eyes and twinkling Diamond flippers. 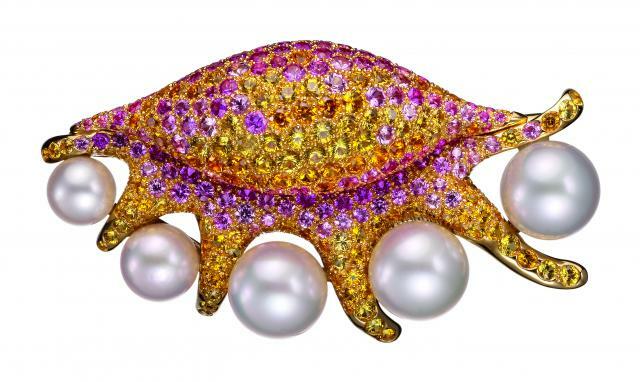 Turtles are many peoples favourite Sea Creatures and at Boucheron there is one waiting to find a place on your finger. The Pendentif Cyprus broche is another piece in Pinks and Gold with Pearls that will make an attractive addition to a lapel, a scalf or a dress. Panda's are my favourite animal. I've loved them since I was very small. Like many people I think it's got something to do with the big eyes, the cuddlesome nature and Baby-ish shape they seem to have. This little Panda has found something special on it's quest for Bamboo. 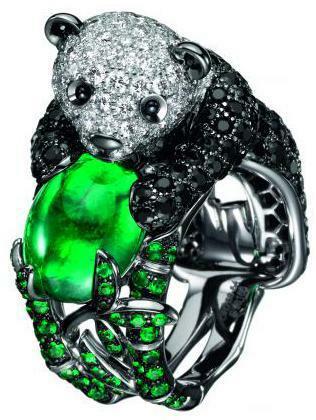 Wrapped around this form of a ring the Panda has it's paws on a giant Emerald. 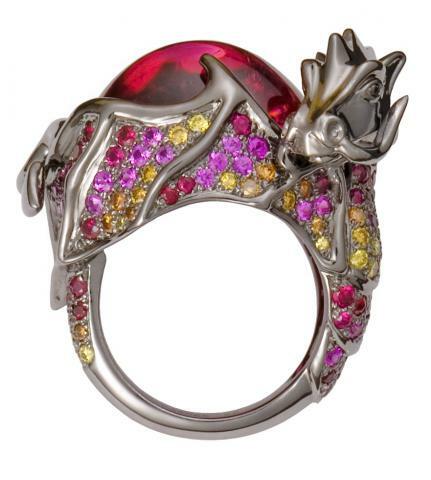 Although not edible this ring combines in the Panda and gem stone two tradditional sybols of good fortune in China. I also think it's pretty cute. Next to Panda in the Exotic Parade collection is Simba the lion. I think he may have turned up in the Lion King a few years ago and here he is again on a ring. I think this piece is just extraordinary and it makes me think about how much fun the Mains d'Or and creative directors must have thinking up and making these pieces. Bewitching Snakes plays on the idea of the snake being captivating, perhaps not in a good way. However in ancient times the Snake was also know as a symbol of goodness and wisdom. This Bague will fit neatly onto the finger and cause a bit of a stir. I chose this ring becasue I like the colour of the stones that make up the snake and the snakes posture of holding on protectivly to the Phytie Rose stone that it's wrapped around. It's as if it's guarding it to give to it's snake paramour, I have such an imagination! I picked out these three rings from the Tales and Legends collection. 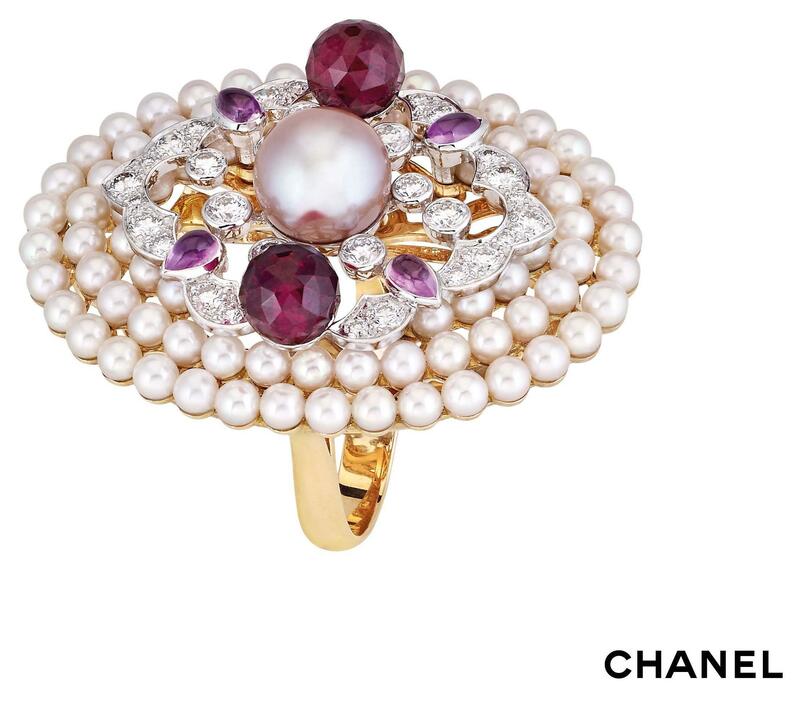 Channeling with the Ancient Greek Theme is the Bague Cheval Pegase in the centre. 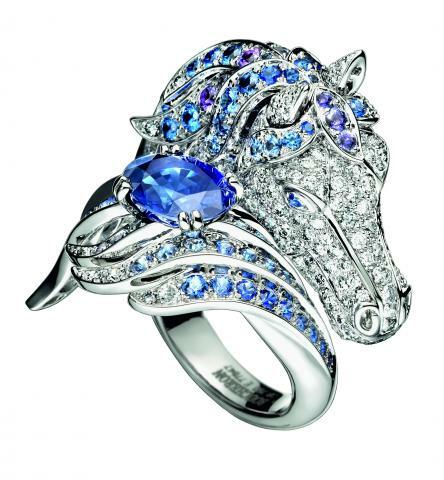 The beautiful Blue stones and White diamonds blend to create a well sculpted Horses head. I ride and love Horses. They are such special, magical animals and when I was small I the tale of Pegasus was one of the stories that drew me towards the ancient world. The last ring is fashioned in the shape of a creature that we know well in the UK and Europe. The Dragon. This Draggon has a huge humped back, rounded and suggesting the fire that he will breath out of his tummy at any moment. His head is turned staring acutley to scan the horizon for more places to fly to. 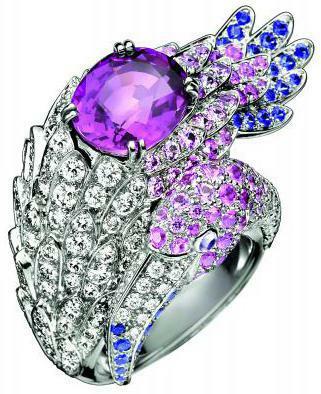 His wings are covered in Gold, Pink and Red stones and sit quietly tucked under his body. He would be an intriguing companion on the finger and is sure to draw admiring glances and warm comments. From the Flights of Fancy collection. 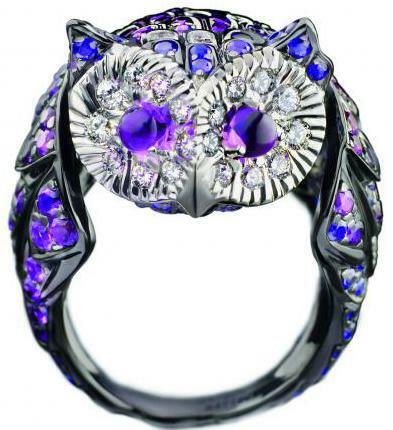 The Bague Chouette is a beautiful Owl that reminds me of the wise Owl of Athens. It's eyes are twinkling at you with subtle feather engravings and diamonds creating the image of it's face. 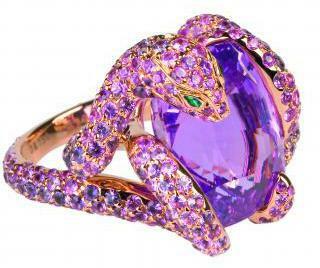 Next is the Pink Flamigo that is made in Rose-Violet stones and Diamonds. Wrapped around the finger the head and the beak are tucked under the wing. The central jewel is perched on the Flamingo's back and perhaps it's the egg that's it's looking after. 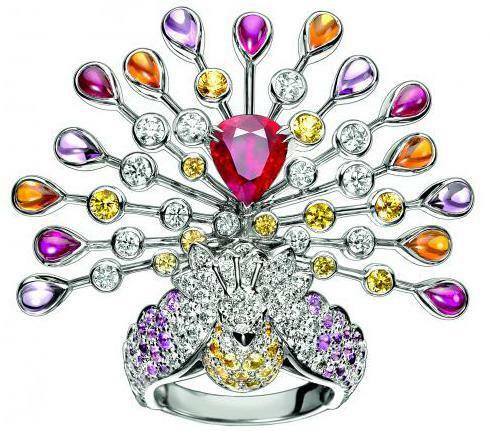 To the right is the Peacock Ring. In terms of a bold statment this is literally the most radient in the collection. The feathers fan out across the surface of the hand or I believe the ring can be turned around the encircle the base of the fingers. This little Elephant is one of several that you really do need several minutes to just stop and look at. The detail of the Workmanship and precision of placment of the stones become more amazing, the more that you look at it. 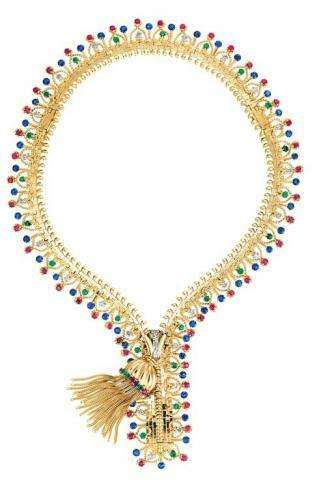 The strong colours here are very reminiscant of Indian Jewellery and traditional textiles. Beyond the beauty of the Elephant I was transfixed by detailed the 'rug' that covers the Elephant's back is. 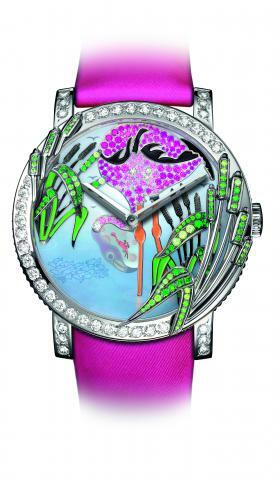 This last piece in my selection from Boucheron is a rather Montre showing a Flamingo in water with it's head submerged. I love the (Blush of Rose) Electric Pink strap and the use of Pink and Black with White Diamonds in the colour scheme. I think this would make a very unusual special present for a young lady who liked animals and was interested in fashion and design. 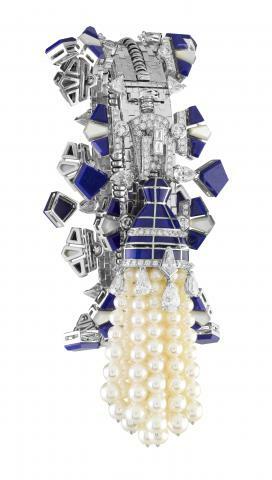 Chaumet celebrated Haute Joaillerie week with the Bee My Love collection. The Bee is a symbol of many thngs. 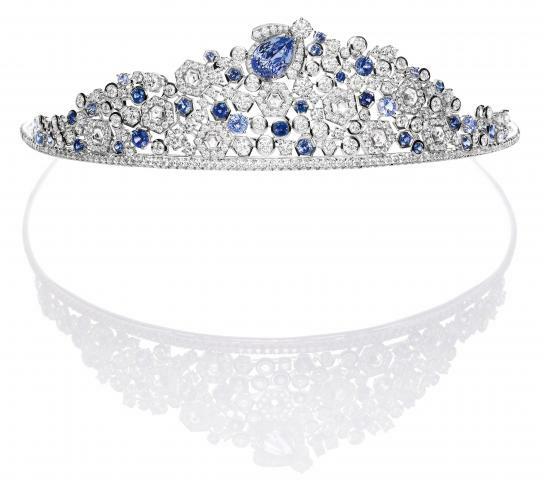 In keeping with Chaumets heritage as the home of the Tiara it is an emblem of Royalty. It can also represent strength, continuity and love. This first ring form the Bee My Love collection places two Bees across the broad upper part of the finger. In matching colours they could symbolise him and her the two parts of a union of kindred spirits. The diamonds set around them give added sparkle and perhaps give the creative impression of the Bees flying through the air. It is true that women and girls don't wear Tiara's and Diadem's as often as we used to in the past but at Chaumet, the home of Tiara, they are still keeping this craft alive. Each year a steady stream of clients do come to them and commission more of these beautiful pieces to keep the craft alive. Be my love celebrates romance and the tradition of the tiara. I do find myself, just for a minute, imagening descending the staircase of their home in the Place Vendome wearing one. In my case it would probably be a Tiara cast but they are beautiful enough in themselves. The Be My Love Montre is a piece that will fit more effortlessly into your day to day life. 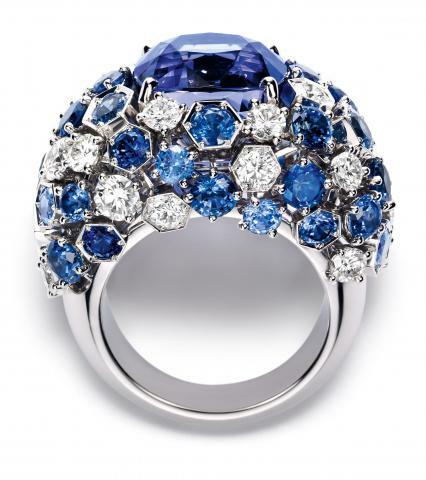 It's a little romantic keepsake in the same hypnotically Blue stones that are used in the rings below. (C) All images with kind permission of Chaumet. 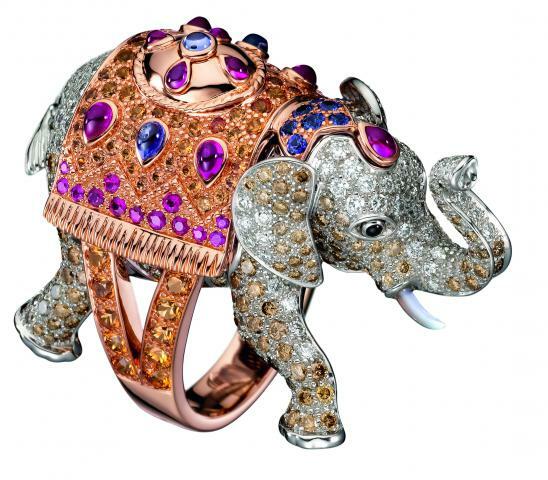 These two rings are so beautiful and capture the essence of Haute Joaillerie. They are telling a little story through the artistry and placment of the stones. In the first ring to the left you can see the Bee clearly buzzing close to the Aqua coloured nectar. 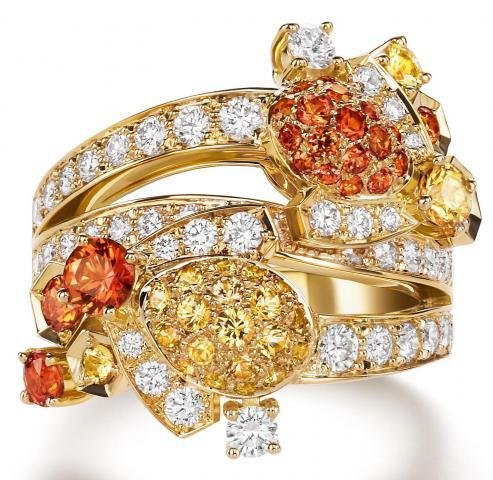 In the second ring to the right the colour scheme is simplified and with diamonds and Saphires nestled around a central statment stone. These would both make very special and very unique engagment rings. What better way to propose to someone than with a Bee My Love ring? Below is a diadem of the simple circlet design. I love the little Bee moteif placed just to one side of band that will almost act as a jeweller fascinator when worn. I would love to wear this piece. It's light and pretty and understated. To complete my look at the Bee My Love collection below there are two necklace sets. The first is honey coloured with Amber stones and diamonds set into cut squares making Hexagons to represent the Bee hard at work in it's home. We are all busy Bees on the go in modern life wherever we are in the world and it's hard work that makes life rewarding. I love the little Bee clustered inside it's little home at the centre of the pendant. The second Bee my Love necklace set (parue) below to the right uses an aqua colour theme and the Earrings that use alternate stones down the length of the pieces again there is a little Bee at the centre of the little nest that it's created with the pendant dropping down nectar to complete the piece.